took off on the first leg (between San Francisco and Phoenix) of an aerial odyssey across America without a drop of fuel! Solar Impulse, piloted by Bertrand Piccard this morning, took off from Moffett Field into the Bay Area’s skies at 9:12 A.M. ET and headed south toward Arizona. “A flying laboratory for clean technologies, this prototype is the result of seven years of intense work in the fields of materials science, energy management and man-machine interface,” Andre Borschberg, Solar Impulse’s co-founder and CEO, said before the flight. Borschberg and Piccard will be taking turns in the pilot’s seat for a month-long series of flights that will end up in New York around July 4th. Each leg of this odyssey will be streamed from this site and the project plans to collect thousands of names that will be added to a “Clean Generation” list of supporters carried in the cockpit. All of Solar Impulse’s power comes from its 12,000 photovoltaic cells on the upper wing surface and store the electrical energy in its lithium polymer batteries under the wing when the sun isn’t shining. This carbon fiber aircraft has a long/wide wingspan and light design because the plane generates as much power as a motor scooter for its four 10-horsepower motors. Just a quick refresher on Solar Impulse: Its pilot and co-founder Piccard is a record-setting, round-the-world balloonist who draws financial backing from Swiss business. 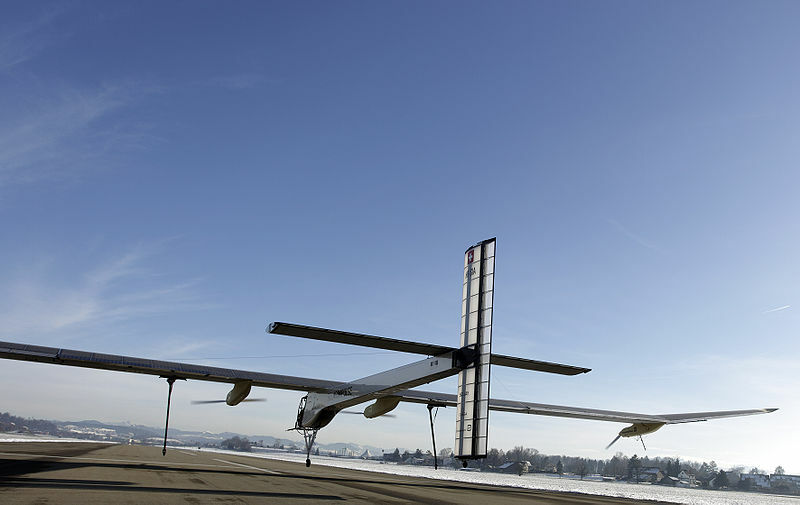 In 2010 Solar Impulse took on the world’s first solar-powered 26-hour night flight in Switzerland. 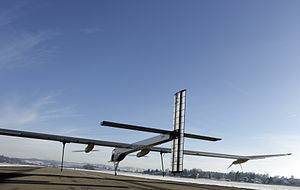 In 2011, it completed the first international solar flight from Switzerland, Belgium to France. 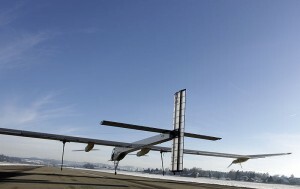 In 2012, it completed the first solar-powered intercontinental flight from Europe to North Africa. Due to the overwhelming response on last week’s post on solar car, it would be fitting to bring you the report on earthling’s progress in Solar Plane, the Swiss Solar Impulse HB-SIA, below, undertaken at the Ecole Polytechnique Federale de Lausanne. This project was initiated in 2003 and then promoted by Bertrand Piccard (who co-piloted the first balloon to circle the world non-stop);it has grown to a multi-disciplinary team of 50 specialists from six countries and assisted by about 100 outside advisers. To top HB-SIA, the HB-SIB is planned for completion in 2011, with a pressurized cockpit (with supplemental oxygen and various environmental support to the pilot to allow a cruise altitude of 12,000 m (39,000 ft) and advanced avionics to allow for transcontinental and trans-oceanic flights, with wingspan of 80.0 m (262.5 ft), slightly wider than the 79.75 m (261.6 ft) wingspan of an Airbus A380 ( the largest passenger airliner in the world). A round-the-world flight is in the forecast for 2012;the flight would circle the world in the northern hemisphere near the equator and five stops are planned to change pilots. Once improved battery efficiency allows the reduced weight, a two-seater is envisaged to make a non-stop circumnavigation.